It is a great honor, privilege and sacred task to lead one of Israel’s greatest success stories: the City of Ariel. Ariel has been my home for close to 30 years, and that’s what it is for our 20,000 residents: home. While Ariel is a city, it is also a community, one that strives towards excellence in education, ethical values, and national leadership. We take pride in our national achievements, but also in our continual efforts to improve the day-to-day lives of the people of the city. We welcome you to visit Ariel and be a part of its growing success. 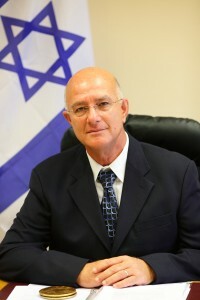 Mayor Eli Shaviro planted roots in Ariel in 1987. He has held senior positions in the IDF, leading him to head the Security Department of the Ariel Municipality from 2003-2007. Following this post, he served as the CEO of the local council of the nearby township of Oranit. He holds an MA in Business from Ben Gurion University and a BA in Political Science from Tel Aviv University. Upon Mayor Ron Nachman’s passing in January 2013, he was selected to serve as acting Mayor. In October 2013, he was officially elected as Mayor in a landslide victory.